In many respects Densen is Denmark's answer to Naim; it eschews feature-counting, but provides upgradable power supplies on its ampliﬁers and emphasises that audio components should be all about enjoying the music. We couldn't agree more with that sentiment, so the question is; does this latest version of the company's midrange player provide enough entertainment to warrant its asking price? One factor that you have to consider when it comes to price is he remote handset. The Gizmo, as its dubbed, adds £150 to the cost of the player, and so is not a minor consideration. It is beautiful, but a plastic 'freebie' could be just as practical in this day and age. The player is attractively hewn out of aluminium slabs - quite sharp-edged ones at that - and the styling is very chic in a minimalist Scandi-style. The XS sufﬁx indicates that this is a replacement for the B-420+, with the main changes being the addition of a digital input and the option to add one of Densen's external NRG power supplies. 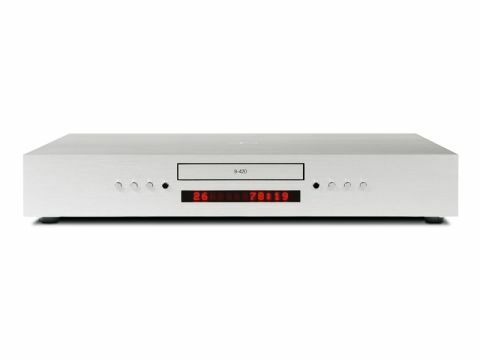 The player runs a modiﬁed TEAC transport mechanism and has a shielded 24-bit DAC that can be bypassed via a switchable digital output on a BNC connector. Being an ampliﬁer maker, Densen goes to some lengths to suggest that the power supply in this player is of power-amp quality, scaled down one assumes, to preamp levels for the six-watt output stage. Needless to say, it 'goes large' on supply regulation and parts quality. The outputs from the Densen were very well-matched at 1.991Vrms left and 1.990Vrms right. Our results point to a very well-mirrored layout within. However, a disappointing jitter result is likely, contributing to an overall rather disappointing performance with crosstalk in the range of 75dB and dynamic range only reaching 92dB. The low-level distortion figure of 3.4 per cent tarnishes an otherwise very good result as well. The frequency response only drifts by 0.21dB at the extremes, but a high-performance amplifier and true full-range speaker system will noticeably lack detail in the extremes due to the phase errors occurring. Power consumption may become a consideration for anyone ecologically, or economically inclined as the unit in standby uses six Watts. A solid CD player, although by no means anything special beyond the build quality and aesthetics. Much like its Salisbury-based counterpart, Densen components have a sound all their own. So our panellists had two main gripes, one being the lack of image depth, which was variously described as "ﬂat", "small-scale" and "ﬂatter", and the other being a tonal thinness that showed up as "voices lacking in character" and "lacking bass weight". In fact, the most generous thing anyone could bring themselves to note down was that Walk on the Wild Side was "very relaxed", but even this was counterpointed by comments suggesting it has too much attack and "seems compressed"! The issue of attack is what really differentiates Densen components and causes the polarised response to them. If you are after a pacy sound with plenty of emphasis on leading edges, there isn't much competition (even from Naim, whose electronics are a bit more sophisticated these days). Our panellists didn't respond positively in our sighted listening tests, but you can't deny that this player does what it says on the tin; music should be fun. If you can listen through the balance and aren't too concerned about imaging qualities, this is a genuinely air-guitar-inspiring player, and that can't be a bad thing. Densen goes to great lengths to build high-quality components and makes ﬁrst-class casework for both components and the Gizmo remote. This goes a long way to explain the cost of the player, and for individuals with a penchant for rock, the B-420XS is worth auditioning.